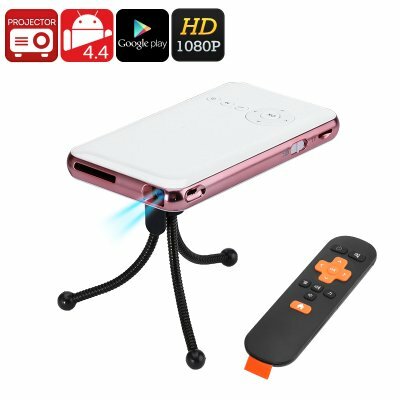 Successfully Added Android Mini Projector - DLP Technology, 1080p Support, 150 Lumen, HDMI IN, Dual-Band WiFi, Google Play, Miracast, Quad-Core CPU to your Shopping Cart. With its Android operating system, this mini projector is so much more than a regular DLP projector. With access to the Play Store, you can always download games and Applications. With Dual-Band WiFi at your side, this Android mini projector even allows you to browse the web. Thanks to its Quad-Core CPU, it is capable of handling sophisticated media. Naturally, it can also be used for regular presentation purposes thanks to its HDMI IN support. With a 4200mAh battery, it provides up to 2 hours of continuous usage time on the go. Emitting 150 lumen of bright light, this mini projector turns every dark room into a cinema. It supports DLP technology thanks to which it provides smooth images and a wide color gamut. By supporting 1080p files, it allows you to project Full-HD movies. Additional features such as Miracast and Airplay further increase your user experience. This mini projector is perfect for small rooms thanks to its 1 to 5-meter projection distance. To make sure all media is displayed properly, it supports adjustable screen ratios. This Android mini projector comes with 32GB of internal memory. For whom this is not enough the DLP projector packs an additional SD card slot. With all this storage at hand, you’ll never run out of space to save your files and media. This mini projector features a magnificent lifespan of 30.000 hours. Thanks to this, it will serve you throughout the upcoming years. Whether you use it for business or fun, an Android mini projector is the perfect electronic gadget. This Android mini projector comes with a 12 months warranty, brought to you by the leader in electronic devices as well as wholesale electronic gadgets..
Arabic: - البروجيكتور ميني الروبوت - Chinese Simplified: - 安卓迷你投影仪 - Czech: - Android Mini projektor - Danish: - Android Mini projektor - Dutch: - Android Mini Projector - French: - Android Mini projecteur - German: - Android Mini-Projektor - Hebrew: - מקרן מיני אנדרואיד - Hindi: - एंड्रॉयड मिनी प्रोजेक्टर - Italian: - Android Mini proiettore - Japanese: - アンドロイド ミニプロジェクター - Korean: - 안 드 로이드 미니 프로젝터 - Malay: - Projektor Mini Android - Norwegian Bokmål: - Android Mini-projektor - Romanian: - Android Mini-proiector - Russian: - Андроид мини-проектор - Spanish: - Android Mini proyector - Thai: - โปรเจคหุ่นยนต์มินิ - Turkish: - Android Mini projektör - Vietnamese: - Máy chiếu Mini Android.